When we flip open the yellow pages or punch in a search on the web looking for a locksmith, we’re presented a litany of choices. 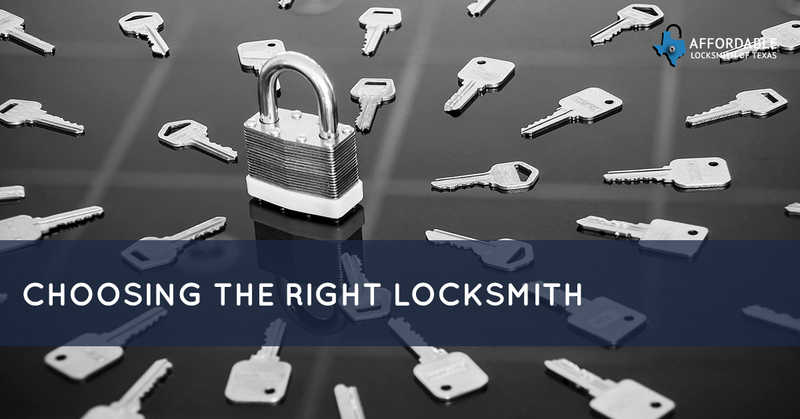 With so many options to choose from, it can be a little daunting choosing the right locksmith for your needs as a home or business owner. But there are a few steps you can follow to ensure that the locksmith you choose is the best one. If you’re looking for a Locksmith in the Woodlands area, you can trust Affordable Locksmith of Texas to meet your needs and exceed your expectations. When you’re looking for a locksmith, the Better Business Bureau suggests you follow these steps. After you carry out these steps, you’ll quickly be able to distinguish a quality locksmith from a glorified lock picker. Before you get too far into your search for a locksmith, it’s a great idea to ask your friends, family, and coworkers if they’ve had experience with any local locksmiths. You can create a list of suggestions, and then start to investigate them yourself. You should check to make sure that address of the locksmith is local to your area, and then do some searches for reviews online. While we’re growing ever more reliant on text messages and emails, a phone call can garner you information that a text-based correspondence can’t. Listen to how the business answers the phone. If they respond with a cheery voice and happily rattle off the name of their business, that’s a good start. However, if they pick up and simply bark out a bland, “locksmith services,” you should be a little more critical. You’ll want to ensure that the name of the business actually matches the one they advertise. Ask for their legal business name, and if they don’t provide it, you can quickly cross that business off your list of recommendations. For the most part, a competent locksmith can use their background and experience to offer you a fair estimate over the phone. Before you schedule a locksmith to work on your home, car, or business, ask for an estimate. Make sure that the estimate includes all of the costs of labor and replacement parts. You should also inquire about additional fees for work done on nights, weekends, travel, and for emergency services. Hold onto this estimate when the locksmith arrives, and if their on-site estimate doesn’t match their over-the-phone estimate, do not let them begin their work until you can resolve the dispute. A well-qualified and trustworthy locksmith is insured and bonded. This means that if your locksmith repairs or replacements damage your property, you will be covered. When the locksmith arrives onsite, don’t hesitate to ask to see their identification and business card. It’s important to make sure that the business name matches what you heard on the phone, and what’s on their service vehicle. Locksmiths also have the option of joining locksmith organizations, like the Associated Locksmiths of America, which hold their members to the highest of standards. Similarly, a reputable locksmith will ask to see your ID to ensure that you are the actual owner of the property. After your locksmithing work has been finished, ask for an itemized invoice that includes all of the fees you were charged for. These fees might include elements, like parts, labor, mileage, and other associated fees. Hold onto this invoice to reference it for future locksmith work. If you were happy with the quality of work that the locksmith did, you’ll want to have their information on hand in case you need them again. All of these steps are important to follow, but if you need a quality locksmith right away, you can save yourself the effort and call Affordable Locksmith of Texas! We’ve been serving the Woodlands community for more than 13 years. We understand that problems with locks and keys don’t always happen between 9-5 Monday through Friday. That’s why we offer 24/7 emergency locksmith services. If you’re locked out of your home, business, or automobile, don’t wait to call us. We’ll resolve your problem quickly, and affordably. Contact us today!